Stratford-upon-Avon, a small and historic Elizabethan market town on the River Avon in Warwickshire, enjoys worldwide fame as the birthplace of William Shakespeare. The town center dates extensively from the 16th and 17th centuries, surrounded by areas of greenery and charming sections of riverbank, as well as the historic Stratford-upon-Avon Canal. Many attractive rows of half-timbered houses have been preserved, including Shakespeare's home, where visitors can still follow in the footsteps of the world's most famous playwright. 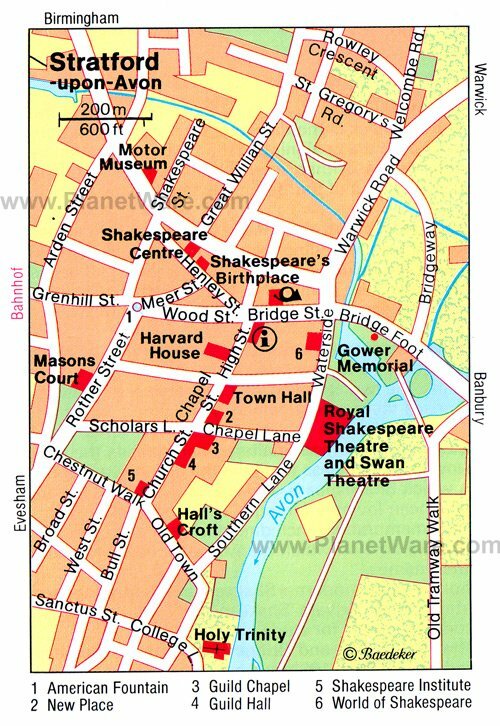 The town is internationally famous as a research center and stage for Shakespeare's works, as well as for the five wonderfully preserved homes associated with him. This culturally blessed setting has repeatedly been used as a backdrop in literature, and today the town lives primarily by the marketing of its most famous son. There's plenty of things to do here, too, including participating in fun festivals such as the famous Mop Fair, held in the town center since the 15th century, as well as enjoying the many great places to eat and shop. Shakespeare's birthplace is a lovely two-story, half-timbered complex, its interior unaltered and reflecting the residential lifestyle of a lower middle-class family in the second half of the 16th century. The rooms have been carefully arranged with period furniture, one of them housing the First Folio edition of his works (1623). Look for the window on which many illustrious visitors have scratched their names, including Charles Dickens, Thomas Hardy, and John Keats. Admission includes the fascinating Shakespeare's Treasures Exhibition, with its rotating displays of memorabilia; Shakespeare Aloud, a chance to watch his plays being brought to life by a troupe of professional actors; and a look at the Glover's Workshop, with its displays of tools relating to the Bard's earlier profession as a glove maker. Adjoining Shakespeare's birthplace is the Shakespeare Centre, headquarters of the Shakespeare Birthplace Trust, with its library and study rooms. Anne Hathaway's Cottage is situated in Shottery, a pleasant one-mile stroll west of the town center. A brick building with half-timbering, a thatched roof, and delightful garden, this picture-perfect country house remains almost exactly the same as it was when Shakespeare won the hand of his wife, Anne. Until 1899, descendants of the Hathaway family inhabited the property. Highlights include 16th- and 17th-century furnishings, and a lovely park has been laid out behind the garden containing examples of each of the trees mentioned in Shakespeare's works. The garden also features other tourist attractions such as the Greenwood Singing Tree, the Music Trail (a musical journey through the woods accompanied by a unique composition inspired by Shakespeare), the Butterfly Trail and numerous exhibits exploring the symbolism of flowers during the Elizabethan period. Named after Thomas Nash, first husband of Shakespeare's granddaughter Elizabeth, Nash's House is a well-preserved Tudor building furnished as it would have been in that period. Next door are the foundations of New Place, bought by Shakespeare in 1597 and where he died in 1616. It's also where he wrote later works such as The Tempest. While there, be sure to explore the traditional Knot Garden, with its many fine sculptures and displays, as well as hands-on activities and Tudor games. One of Stratford-upon-Avon's most attractive Tudor houses, Hall's Croft was the home of Dr. John Hall, who married Shakespeare's eldest daughter, Susanna. Visitors can explore the home's luxurious rooms while examining the fascinating collection of apothecary equipment and books in the doctor's consulting room, along with a first edition of his medical notes published in 1657. Afterwards, enjoy the beautiful garden (including its traditional medicinal herbs) and café, as well as a gift shop specializing in local handmade arts and crafts. An avenue of lime trees leads to the 13th-century parish Church of the Holy Trinity in which Shakespeare is buried. The writer's tomb lies in the chancel between the pulpit and the high altar and is marked by a stone bearing this inscription: "Good friend for Jesus sake forebeare, to digg the dust enclosed heare. Bleste be ye man y'spares the stones and curst be he y'moves my bones." On the wall above is a monument to Shakespeare, and close by are the graves of his wife, Anne Hathaway, his daughter Susanna Hall, and her husband John Hall, as well as of the first husband of his granddaughter Elizabeth, Thomas Nash. The church also contains the late 15th-century font used in Shakespeare's christening and a copy of the parish registers containing the record of his baptism and burial. On the banks of the River Avon, the Royal Shakespeare Theatre is home to the Royal Shakespeare Company and consists of a unique "one-room" theater that allows actors and the audience to share the same space, just as they did in Shakespeare's time. In addition to hosting the works of the great Bard, the theater is home to a rooftop restaurant with stunning views over the River Avon, a riverside café and terrace, and a colonnade linking it to the Swan Theatre. It also has exhibition space with displays related to the RSC's productions, and its 118-foot-high tower offers excellent views across the town and the surrounding area. Afterwards, explore the riverside walk stretching from Bancroft Gardens and the Gower Memorial (1888) to the Church of the Holy Trinity (excellent guided walking tours are available throughout the year). The 16th-century Garrick Inn is richly embellished with woodcarvings and remains a wonderful place for a meal while soaking up the atmosphere of this historic town. Neighboring Harvard House, a half-timbered home constructed in 1596, is notable for having once belonged to the mother of John Harvard, founder of Harvard University (the property is actually owned by the famous American university). Near Stratford-upon-Avon's Town Hall (1769) stands a statue of Shakespeare presented by David Garrick, the famous actor and manager of Drury Lane Theatre in London. Also of interest is the nearby Guild Chapel at the corner of Chapel Lane, a single-aisled Gothic church with a fine wall painting of the Last Judgment from about 1500. The upper floor of the adjoining Guild Hall was, for centuries, used as a grammar school and is believed to be where Shakespeare received his education. The wonderfully eclectic MAD (Mechanical Art and Design) Museum is a unique project developed to showcase "Kinetic Art and Automata" by pioneering artists from around the globe. This fun attraction offers a chance to experience and interact with fantastic machines, including marble runs, high-tech robots, and intricate moving contraptions. Kids in particular love the hands-on appeal of this unique museum, especially the endless array of buttons to press and knobs to twiddle. Just a few minutes' walk from the old city center and a fun break from its many Shakespeare-themed attractions, Stratford Butterfly Farm consists of a number of tropical greenhouses with countless free-flying butterflies. Other highlights include exotic birds (some of them also free-flying), as well as the fascinating Caterpillar Room, with its butterfly breeding programs. Other insects on display include stick insects, praying mantis, and giant millipedes, along with a variety of spider species including tarantulas; black widows; and the massive Goliath Birdeater, the world's largest arachnid. On the outskirts of Stratford-upon-Avon, the Stratford Armouries boasts a broad range of historic arms and armor on display. The museum's large collection was assembled over a period of some 250 years by the Wigington family, once one of the country's best-known weaponry manufacturers. Highlights include a fully armored Indian elephant and one of the world's oldest cannons dating from 1450. Also of interest is a giant crossbow based upon original designs made by Leonardo da Vinci and a collection of artifacts related to Winston Churchill. A magnificent Tudor-style farmhouse just four miles northwest of Stratford, Mary Arden's Farm in Wilmcote was the home of Shakespeare's mother. Now a museum, visitors can experience the daily routine, skills, and crafts that the young Shakespeare would have known from visits to his grandparents in the 1570s. Hands-on things to do include basket-weaving and traditional chores such as threshing, bread making, gardening, and animal tending at Palmer's Farm. Other attractions include archery, falconry displays, rare breed animals, nature trails, and wildlife. Want to use this map on your web site?